As someone who has a stash of nail polish in every colour of the rainbow, I’m shamefully lazy in dressing up my digits. Clack-clacking away at a keyboard all day (the writer’s life!) chips away my painting efforts in no time and, since my nails are brittle to begin with, I tend to leave them bare for months before swiping on a new colour. In a bid to give them a funky new look that lasts, I decided to visit Home Nails to let their eagle-eyed nail technicians work their magic. Housed in The Nomu, a slick condo a hop away from The Cathay, the quaint salon certainly lives up to its name with a cosy, living-room like space that’s spick and span. Everything is cleaned with disinfectant, right down to the remote controls for the telly, and their tools are sterilised after each use. Priding themselves in elaborate nail art that stays on for ages, they’ll offer free fixes if your manicure chips or loses any stick-on elements. 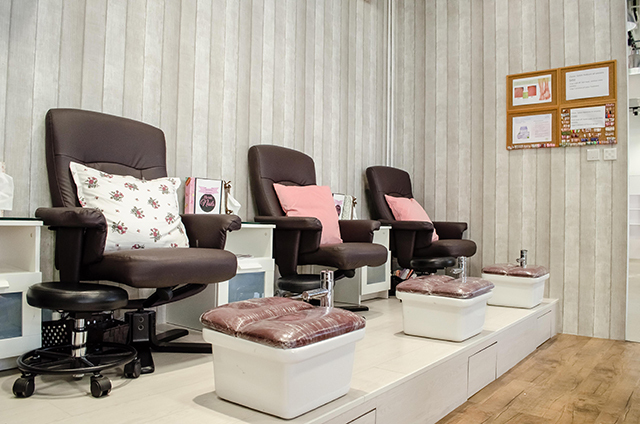 And when it comes to soaking off Gelish, their specially-honed technique is gentle on your hands and feet. They recommended that I try out the Gelish nail art and a keratin anti-ageing spa treatment for my tired tootsies. Major pampering sesh ahead! To prime my nails for pretty designs, the manicurists briskly filed and buffed them into an even, square shape, then carefully pushed back and trimmed away outlying cuticles. Then it was time to unleash their creative, ultra-meticulous side. Deciding on a mismatched yet marvellous design, they painted thin layers of polish on – each nail a different colour – and cured them under LED lights in between coats. I marvelled as my fingers turned into an almost-neon, candy-coloured party. A few of my nails even had a watercolour-like blend of hues that brought back memories of Paddle Pop. My inner child was squealing with glee. As if that wasn’t enough, they brought out the big guns with embellishments. Rubbing on foil patches, dotting on a special coat of clear polish for a ‘bubble’ effect, and sticking on gems, word decals and glossy gold shapes, they created an eye-catching look that I’d like to call “disco-glam unicorn”. To seal in all the incredible 3D details, a special layer of Gelish was applied as a solid shield against chipping and breakage. They told me it could last for a month – it’s been more than two weeks, and my nails show no sign of wear. While my fingernails were being decorated, another manicurist went to work on making my legs feel shiny and new. The treatment started on my toenails, which – after years of being hidden under polish – were dry and dull-looking. Removing my worn-out polish, she filed my nails and massaged in a moisturising oil, before applying a whitening mask to freshen up their appearance. Instant change! Next, she exfoliated my legs from the knees down with an organic, whitening sugar scrub and gently rubbed in massage cream. Then came the most important part. After slathering my legs and feet in keratin, she wrapped them up in cling film and slipped them into bright pink, boot-like massage ‘mittens’. At the touch of a switch, they heated up and vibrated to completely infuse all the smoothing goodness into my skin. As a finishing touch, she patted in an anti-ageing ampoule filled with gold flakes (ooh, lush! ), to keep my skin looking firm and supple. The results? My legs were at least one shade lighter than before and felt silky smooth to boot, while my toes looked in good enough shape to proudly bare in summer sandals, au naturel. 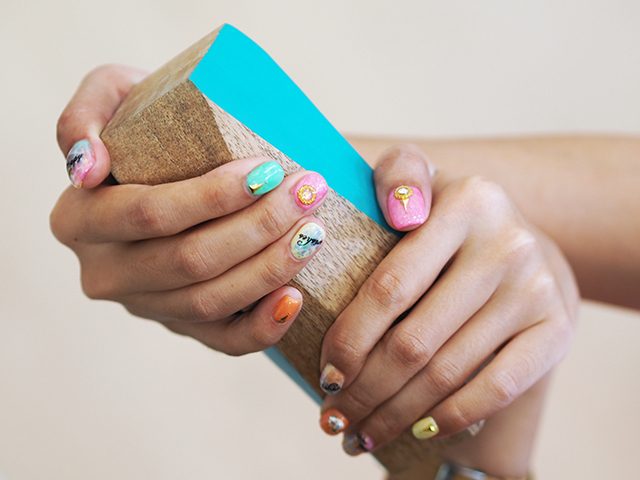 Thinking of adding some statement-making art to your fingers, or indulging in a rejuvenating spa treatment? 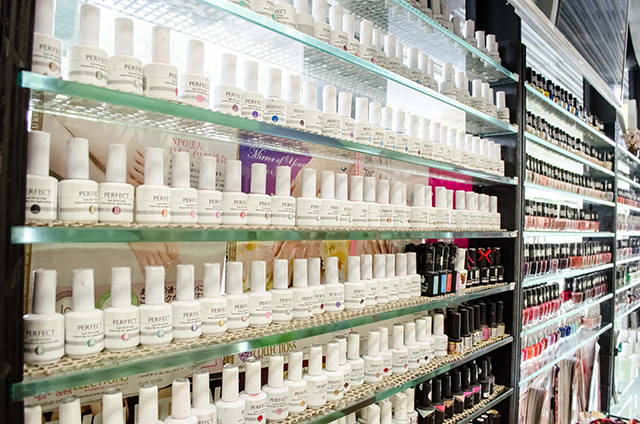 Good news – Home Nail’s excellent services are on the wallet-friendly side (Gelish manicures start from $48), and they’ll gladly explain the breakdown of what you’re paying for, down to the last gemstone used. What’s more, as part of the Great Singapore Sale, they’re offering a 30-percent discount on the Signature Keratin Treatment (usual price $88) until 31 July. Hotfoot it down now!